The mountain railways of India have been a popular mode of escape from the summer heat. Taking travellers to the cool Himalayan outposts, these hill trains always provide a scenic backdrop to experience the surreal natural beauty. Since their inception, these narrow track trains have simplified the access to remote hill stations and offered a strong connectivity to the locals and tourists alike. Known popularly as toy trains for their small size, these hill trains follow a fabulous mountain terrain and offer splendid panoramic vistas that are sure to entice and fascinate any traveller. But beyond that, these trains, due to their share of glorious heritage are always seen with awe and wonder. With their continuous running history of more than a century, these trains display the excellent engineering standards and ahead of the times approach. Even though the technological advancements have taken place at a steady pace, still these trains are marvelled for paving an innovative way to connect the remote Indian hill stations. This is another reason why the mountain railways of India have been termed as a world heritage site. For a modern day traveller, these toy trains might come across as a time consuming affair for their slow speed and outdated technology. But in reality, these toy trains provide a great opportunity in serenading the mountains and soaking in the panoramic mountain scenery during this enchanting romantic mountain trail. Snaking their way through numerous tunnels, hairpin loops and bends also add on to the surreal experience aboard the toy trains here. Such is the passion and the enigma of the country’s hill trains; actively offering travellers to relive their share of quaint heritage in modern times. Presently, there are four active trains running on the narrow tracks in Darjeeling, Shimla, Ooty and Matheran. Three of the four trains have been granted a world heritage site status for the fascinated journey experience they offer to the travellers aboard. The most popular and loved hill train in the country is undoubtedly the Darjeeling Himalayan Railways (DHR). And why not? The train has kept intact the usage of the world’s oldest functioning steam locomotive in its daily chugging. It is surely a lifetime of experience wherein Darjeeling’s beloved train while wheezing the 87 km stretch trails through the rhododendron slopes, lofty hills and flowering loops. Another high of this DHR train is its final stopover at Ghoom, the second-highest railway station in the world. The second hill train, Kalka Shimla railways is another romantic terrain to reach Shimla, the most popular summer resort of the country. The train is in fact a reminiscent of Shimla’s colonial heritage and old world charm. Spread over 96 km, this narrow gauge train covers numerous bridges, sharp curves and tunnels, taking in picturesque views in this heritage trail. The third exclusive train, Nilgiri Mountain railway offers exclusive scenic novelty present in the Western Ghats of South India. 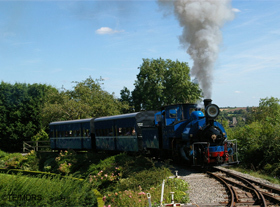 Here also, the engines used are fueled by steam pressure and take a tourist to the snooty and exclusive vistas of Ooty. The fourth mountain train, Neral Matheran Hill Train railway is another light hill train taking tourists to the hill station of Matheran where no other vehicle, not even a bicycle is allowed. This is another great experience of entering the eco-sensitive hotspot through a heritage toy train.